What’s Out of this World? The Stories: While I worried about the movie throwing too many characters into one film, I was quite surprised at the effectiveness of having the beloved characters come to life all at once. The books television show had already accomplished giving each monster his/her/its spotlight, so showcasing the monsters as a collection worked quite well. Each monster still a moment to shine, and not taking too long on introducing each monster allowed the movie to progress nicely. Main Characters: ​Appropriately aged, the cast of characters are funny, lovable, and eccentric. Zach (Dylan Minnette) is the awkward new kid whose mom is the new vice principal at his school. Befriending Champ (Ryan Lee) on the first day, Zach does his best to fit in and heal from the loss of his father in the previous year. Champ is the stereotypical nerd whom everyone ignores, especially the prettiest girl in school, Taylor (Halston Sage). Champ is probably the most lovable character whose humor carries the film. Moving into a new house, Zach sees a mysterious girl next door, Hannah (Odeya Rush) whose father (Jack Black) is extremely paranoid and protective of his daughter. A quick side note: Odeya Rush looks just like a younger Mila Kunis. Family Fun: ​​When I left the theater, the first word that popped into my mind was "fun." Having grown up loving R.L. Stine's Goosebumps and Fear Street series, I was a bit of a fan girl as I watched the stories come to life. Realizing that that movie wasn't really intended for my age group, I wasn't setting my expectations too high as far as my own personal enjoyment. But I was very wrong. I laughed throughout the entire movie and rooted for the main characters, just like I would if I were the more appropriate age group. For children, the images are not frightening, and the overall mood is not scary. 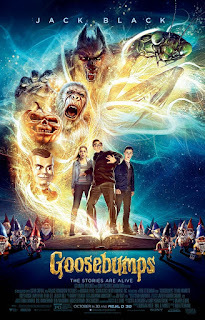 Yes, a Goosebumps movie wants to gross you out and make you feel a little jumpy, but it's nothing a kid can't handle. Parents will enjoy this movie as much as their children. Teachable: ​​Asa teacher, I am always looking for ways to incorporate film into the classroom, and this one fits the bill for a certain unit. Teaching a unit on short story structure? Working a film into a suspenseful Halloween unit? This movie is perfect for elementary through high school grades. You don't have to worry about inappropriate material, and the story of Zach and Hannah's potential relationship is innocent. I will be adding this to my video request form next October!